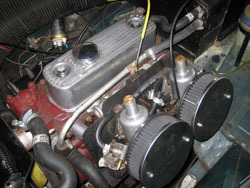 As any of you who read my blog will know my midget recently suffered a cylinder head gasket failure. 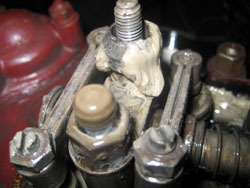 This resulted in water getting into the oil and causing a "mayonaise" build up. 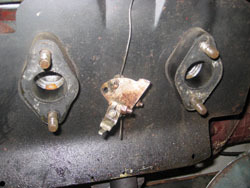 First of all I set about removing all the water hoses that are connected to the cylinder head. this was followed by the removal of fuel lines, vauccum advance pipe and the choke cable. I decided to leave the throttle cable attached to the carb linkage, as in the past i have found this job fiddly and awkward, and have lost many a split pin in the process. 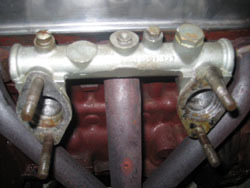 The heatshield and throttle linkage were simply tucked away at the side of the engine bay, allowing access to the manifolds so that the fixing bolts could be easily removed with a ratchet and extension bar. After the cylinder head was stripped of all of the mainfolds and other bits and bobs, I decided to unvail the full horror of what lurks within. 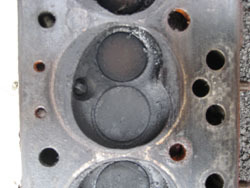 Removal of the rocker cover revealed a mess of sludge, all of which would have to be cleaned. 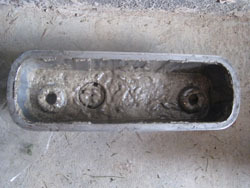 The sludge was everywhere, from the inside of the rocker cover, to the rocker shaft and it was also clogging up all of the oil ways. As there was already water in the all of the oilways, I decided it was not necessry to fully drain the cooling system before removing the head. (no point flooding the garage floor!) 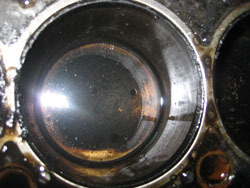 however there was a bit of water that found its way into the cylinders, this was quickly cleaned out with some kitchen roll, before they were given a light oiling to prevent rusting whilst they were exposed in the garage. 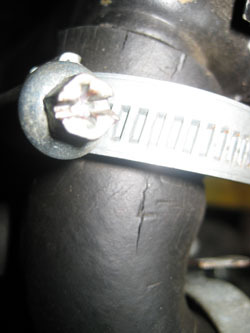 Another problem was higlighted during the head removal, and that was of damage to the hoses. These hoses were fairly new, less than two years old, but already they were showing signs of deteriation.